Vegemite and cheese sandwiches are staples in the lunchboxes of many Australian school students but an alarming number of students come to school with no lunch at all. Eat Up is trying to changing that, making vegemite and cheese (or just plain vegemite) sandwiches available through 18 Ballarat schools to students who would otherwise go hungry. Ballarat Grammar students have been making sandwiches for Eat Up all year and yesterday slapped together their 5000th sandwich for the year. BUTTER UP: Ballarat Grammar students Hugh, Tom, Lily and Gemma man the sandwich production line with Eat Up founder Lyndon Galea. Once every two weeks, a rotating roster of 20 students get together and make 400 to 600 sandwiches which are individually wrapped. Volunteers from Alfredton Rotary Club then deliver the sandwiches to schools who put them in the freezer ready to be thawed and distributed to children in need. At the beginning of the year, sandwiches were being sent to six Ballarat schools and there are now 18 involved in the program. Across the state there are about 3500 sandwiches distributed every week to 185 schools and the numbers are swelling. This time last year only 50 schools received the lunch staple. Eat Up founder Lyndon Galea had no idea his sandwich idea would get so big. “It started in Shepparton where I grew up. I read a newspaper article profiling two local schools where kids regularly arrived at school with nothing from home and were going hungry. Ballarat Grammar students making sandwiches for Eat Up program, to be given to local primary schools. So he made some sandwiches at home with his friends and mum and took them to the schools. He assumed it was an isolated case until he saw Foodbank Australia research that one in eight Australian children arrive at school hungry each day. His plans grew and he sourced food from a local foodbank and help from apprentice chefs at a local TAFE to make more sandwiches and deliver enough to schools to last them two weeks. “I was lucky that as our confidence grew that we could help. If we became aware of the issue at a point where we weren’t confident we could take the next step, or if we were aware it was such a massive issue at the beginning, we may have been too intimidated to start,” he told Ballarat Grammar students during an assembly. 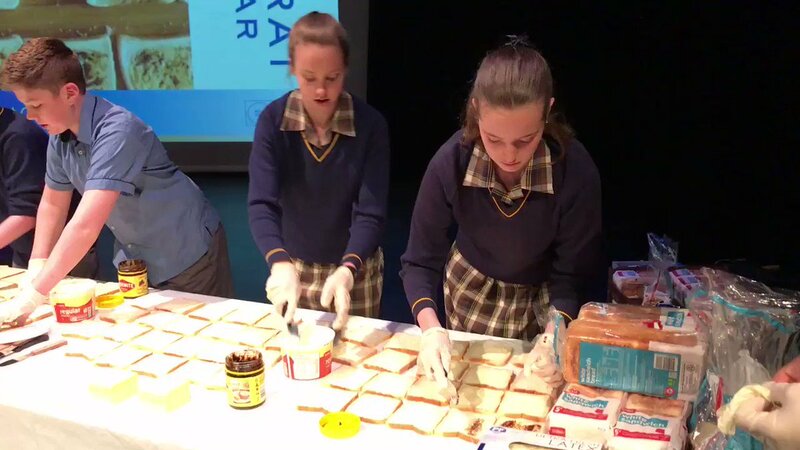 Before Ballarat Grammar’s involvement, the charity conducted one-off sandwich making workshops with different organisations and workplaces. The school did a one-off sandwich preparation event last year, but when the school’s leadership and services coordinator Matt Hanlon suggested they could make hundreds of sandwiches each fortnight, and Alfredton Rotary got involved to help with distribution, Mr Galea realised this method could help even more hungry students. “The growth has been pretty steep. It’s encouraging in that we can reach more kids but to get such an insight in to how broad the issue is is pretty harrowing,” he said. Mr Hanlon said having year eight and nine students help make sandwiches once a fortnight was a manageable way to have a big impact. “Service is really important to our school and we thought we could do this every fortnight,” he said.